It is not too surprising that many tropical ecologists consider ants to be such superior predators. 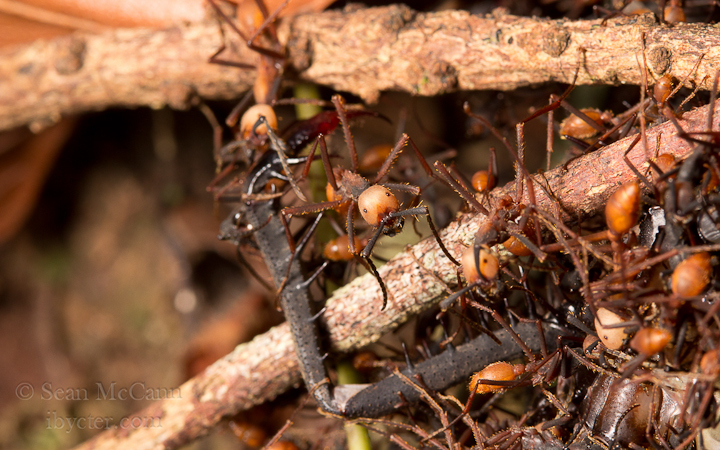 Come across an army ant swarm, and you are likely to witness many hundreds of acts of predation playing out before your eyes on the jungle floor. An army ant swarm is like a blitzkreig, and it would seem that nothing can stand in its path. Even social wasps, normally so aggressive in nest defence, will abandon their nest immediately rather than risk the entire colony in a vain attempt to repel the tens of thousands of army ant raiders. But is it really accurate to infer from these types of observations that the risk of predation by ants on nests of social wasps surpasses that of all other predators? This never really sat right with me, particularly considering how an army ant predation event on social wasps is a random, and probably relatively rare event. Army ants cannot see, and they do not target wasp nests in particular. Even those species which prefer preying on social insects are much more likely to be raiding other species of ants rather than wasps. How would army ants stack up against a true specialist wasp predator, such as the Red-throated Caracara? Luckily, I had some data to work with to answer these questions. I have written this up in a paper in Insectes Sociaux, which unfortunately is not open access, but you can email me for a copy! From our nest camera study in 2008 and 2009, we had footage which showed adult provisioning of single caracara chicks (McCann et al. 2010). In order to calculate the number of wasp nests per day consumed by the chicks, we lumped all events of provisioning with nest fragments of the same genus being brought within 30 min of each other. Each of these events was then termed a “unique nest delivery”. By summing the unique nest deliveries daily for the two sampling periods, we found that a single caracara chick eats between 7.8 and 12.4 nests per day. If we assume that the adults are eating just as many wasp nests, a group of 6 adults would consume 46-74 nests per day (not counting the chick). 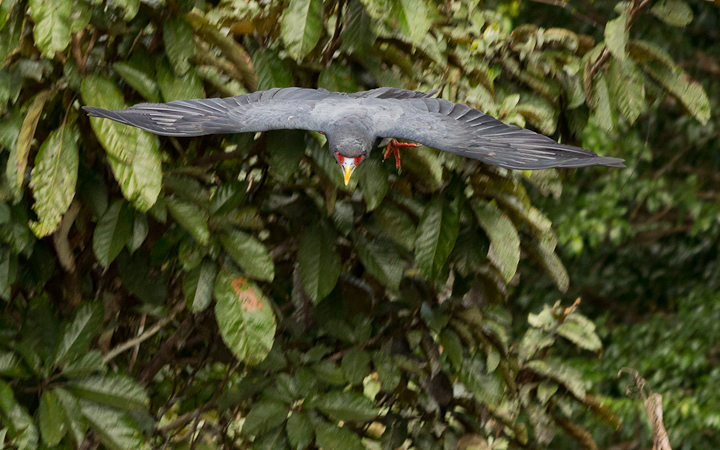 On a per-hectare basis, caracaras could possibly be consuming 0.117-0.186 nests/ha/day. Wasp-eating machine! 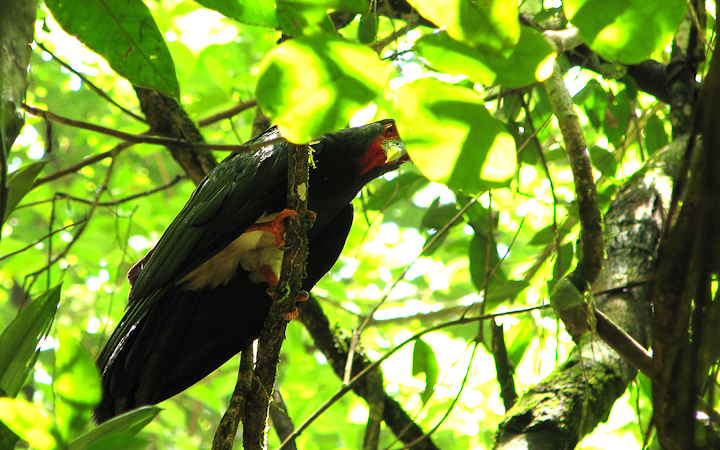 Is the Red-throated Caracara a major source of colony failure in Neotropical social wasps? To compare this rate of predation with that of army ants, we needed an estimate of army ant density. Unfortunately, only one method for assessing Eciton density has been developed, for Eciton burchellii. This method was developed by Nigel Franks, and relies on the predictable behaviour of swarms of this species (Franks 1982). These ants raid in a roughly linear column from their bivouac site, extending the raid 7 m per hour. The landscape at any given time is thus like a plane with many lines of ants of similar length scattered about it at random. The probability of encountering a swarm is thus proportional to the density of colonies in the area, and by repeated walks of suitable length, an estimate of the total density can be made. Mathematically-inclined readers may realize this is an extension of the problem of Buffon’s Needle*, and relies on similar calculations Incidentally, Buffon also published the first species description of the Red-throated Caracara. You can read about that here. Catherine Scott and I went to the Nouragues station in 2012 to perform an estimate of the Eciton burchellii density in order to calculate the potential impact of army ant predation on social wasps. 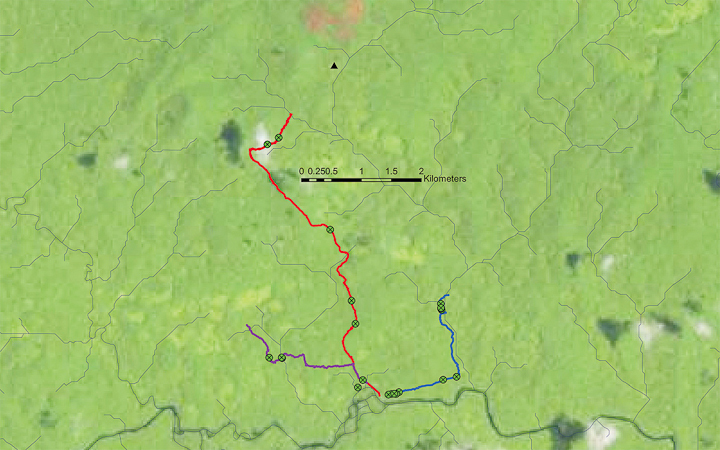 Here are the three trails we surveyed. We walked each trail 5 times, for a total of 72 km. Each encounter with an Eciton swarm is marked with an X. We encountered Eciton burchellii only 5 times, translating to a density of only 0.021 swarms/ha. Our estimate for Eciton burchellii density was a moderate 0.021 swarms/ha, pretty well comparable to other lowland rainforest sites. But how many wasp nests could each swarm take? Well, there is no easy answer for this, but there was only one study that documented rates of army ant predation on social wasps. Ruth Chadab published an estimate of 1-3 nests per day taken by Eciton hamatum, a related species with a greater predilection for social insect nest plundering (Chadab, 1979). Because we had no estimate for daily wasp nest predation for E. burchellii, we used Ruth Chadab’s estimate of 3 nests per day as a rough approximation. This translates into 0.06 nests/ha/day, or 24 nests per day in a 400 ha caracara territory. We conclude that Red-throated Caracaras, as specialist wasp predators, are comparable to army ants in their predatory impact on social wasps. Taken together with other species, such as monkeys, antshrikes (McCann et al. 2014) and woodpeckers (Sazima 2014), social wasps are at considerable risk from vertebrates. So what about vertebrate predators and the adaptations of social wasps against them? If we look carefully at social wasp behaviour, it is easy to see how much vertebrate predation has influenced both behaviour and nest architecture. For one, massed stinging attacks are ineffective against ants, and are definitely a feature that protects wasp colonies from vertebrate attack. Audible warnings, such as those produce by Synoeca, would not be effective against ants, nor would visual camouflage (ants hunt by scent, and army ants cannot see anyway). 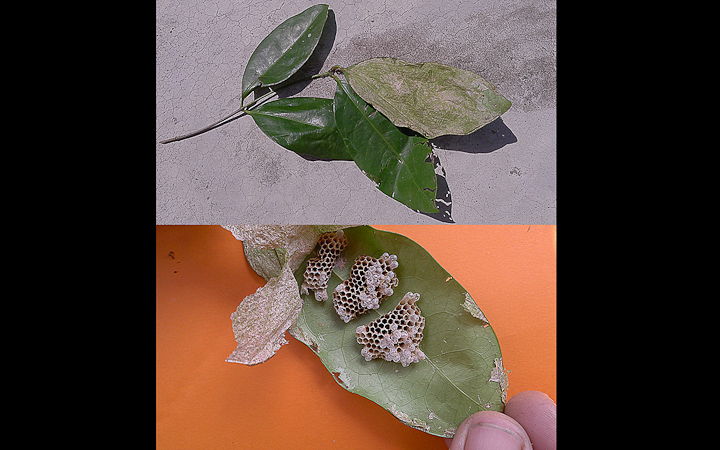 Visual crypsis of Leipomeles dorsata nest.The envelope of this nest is fitted carefully to the underside of the leaf, and made to resemble it in colour. Photo by Alex Popovkin, used under a Creative Commons 2.0 licence. Likewise, armouring of a nest, such as is seen in some Epipona and Chartergus wasps (Richards 1978), would have limited effect on ants, as they can enter and take prey through any opening a wasp can. Analogous armouring consisting of a mud envelope is evident in this Polybia singularis nest. In 5 seasons I worked at the Nouragues camp, this nest never fell prey to the caracaras. What is notable about the nests of most wasps with armoured envelopes is that they are often located high up in trees, easily visible on distal branches. The wasps may gain some protection from ants by nesting so high, which they can afford because they are (by virtue of the strength of their nest) already relatively safe from vertebrate attack. Nest of Polybia singularis, with an envelope of hardened mud. Such nests can weigh up to 5 kg! This nest was never taken by caracaras in all the years I studied at the Nouragues station. As more and more naturalists describe and publish their observations of Neotropical biology, we are continually discovering new things. I hope that this study, gained in a few short months of research adds to the understanding of the role of vertebrates as predators of social wasps, especially the important role of the Red-throated Caracara. In a future post I will take up the issue of the diversity of wasps taken by caracaras, and what some of the numbers might mean for tropical wasp biologists. Please do go and read the paper, and if you do not have access to it email me for a copy! CHADAB, R. 1979. Army ant predation on social wasps. PhD Thesis. University of Connecticut, Storrs, CT.
CORBARA, B., CARPENTER, J. M., CÉRÉGHINO, R., LEPONCE, M., GIBERNAU, M., and DEJEAN, A. 2009. 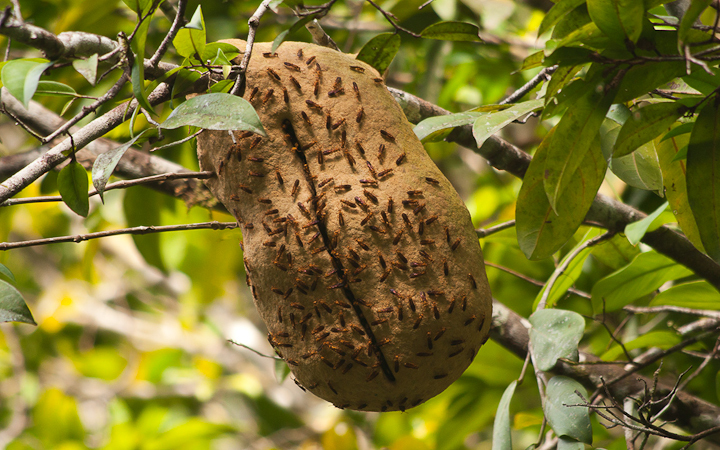 Diversity and nest site selection of social wasps along Guianese forest edges: assessing the influence of arboreal ants. C. R. Biol. 332:470–479. FRANKS, N. R. 1982. A new method for censusing animal populations: The number of Eciton burchelli army ant colonies on Barro Colorado Island, Panama. Oecologia 52:266–268. MCCANN, S., MOERI, O., JONES, T., and GRIES, G. 2014. Black-throated Antshrike preys on nests of social paper wasps in central French Guiana. Rev. Bras. Ornithol. 22:300–302. MCCANN, S., MOERI, O., JONES, T., O’DONNELL, S., and GRIES, G. 2010. Nesting and Nest-Provisioning of the Red-throated Caracara (Ibycter americanus) in Central French Guiana. J. Raptor Res. 44:236–240. RICHARDS, O. W. 1978. The social wasps of the Americas excluding the Vespinae, p. vii, 580 p., 4 p. of plates : ill. (some col.) ; 2. British Museum (Natural History), London. SAZIMA, I. 2014. Tap patiently, hit safely: a preying tactic of the White Woodpecker on social wasp nests. Rev. Bras. Ornitol. 22:292–296. Well-researched and presented. It should be published if not already. Yep, it is out there! It came out over the holidays.